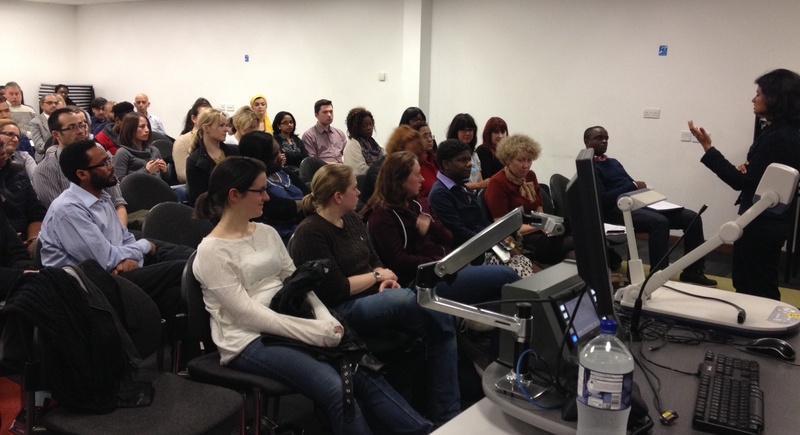 The Spring Meeting of the Institute of Biomedical Sciences London Region Cellular Pathology Discussion Group was held in the New Cavendish Street Campus on the evening of 27 March 2014. Over 100 delegates attended the meeting to listen to two presentations on lymphoma, a class of solid white blood-cell cancers that may present a variety of diagnostic challenges. It is important to identify the type of lymphoma as this will determine which treatment strategies should be administered to the patient. 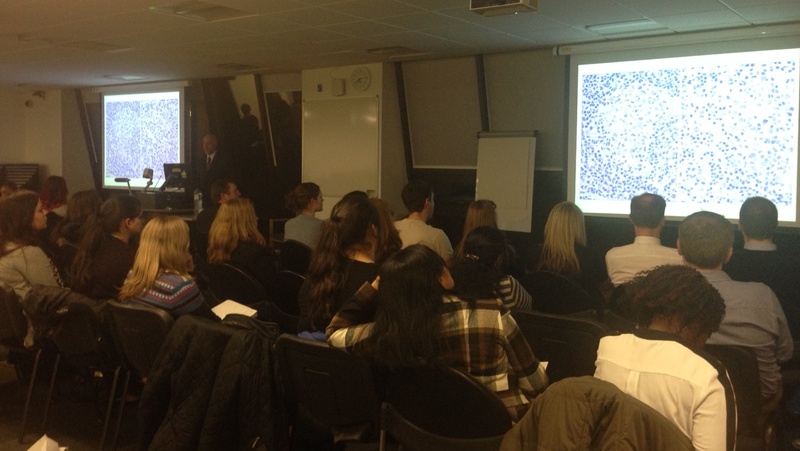 The first speaker was Dr Ayoma Attygalle, a consultant histopathologist from the Royal Marsden NHS Foundation Trust. In her talk, she outlined the clinical presentation of angioimmunoblastic T cell lymphoma (AITL) and its differential diagnosis from other similar conditions. AITL is a rare but aggressive non-Hodgkin lymphoma derived from T-cells. However it has many overlapping characteristics with other specific variants of T cell derived lymphomas and may even demonstrate the presence of cells that resemble the classical Reed-Sternberg cells found in Hodgkin lymphoma. The talk focused specifically upon the morphological and molecular markers that can be used to discriminate between not only different lymphoma types, but the different histological patterns associated with AITL (Attygalle et al., 2013). for requesting special stains or immunohistochemistry and that expert referral should always be considered if in doubt. If you would like a copy of the slides from Dr Alan Ramsay’s talk, you can download them via this link. This meeting was chaired by Dr Tony Madgwick (Department of Biomedical Sciences, University of Westminster) and sponsored by Dako, Roche and CellPath. For more information on the IBMS London Cellular Pathology Discussion Group and its activities, please browse the pages of this website. Review written by: Dr Tony Madgwick.